Paul Jaminet shared this on Facebook. Maybe I'm just an uninformed jerkface, however I'm a little surprised at what some of the paleo experts eat for breakfast. Various of these nutritional gurus, who have the means to eat whatever, whenever they want, seem to be making some suboptimal choices if we're judging them from a BP standpoint. If this stuff works for them, then all the more power to 'em, but I thought I'd share this so that we could flex our elitism muscles and judge away. Chriss Kresser's breakfast: A whole hell of a lot of dairy. Robb Wolff: Omega-enriched eggs? Really, bro? Rhonda Patrick: How does one get flax milk? Do flax seeds lactate? Kris Gunnar: "I fry my eggs in olive oil!" YOU'RE DOING IT WRONG. ENJOY YOUR OXIDIZED FATS, BUD. All of these people are probably healthier than I am, so hey, if this stuff works for them, great! Would be curious to hear the rationale behind their choices. Interesting read, at any rate. 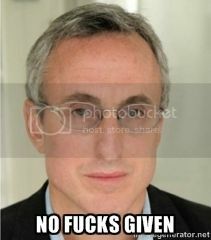 Also, I love how smug Gary Taubes looks in virtually every picture of him I've ever seen? I'm surprised Robb Wolf doesn't drink the "Robb Wolf blend," as Joe Rogan calls it. One of these guys should answer with: egg whites, a slice of toast, diet coke and a Slimfast.